Studies show that when society make a New Year’s Resolution to have a healthier body, only 25% of these resolutions are actually kept for 30 days. Only 8% actually stick to the resolution. Wow! These percentages are so low! A majority of people who make New Year’s Resolutions are doing it because it’s just what you do at New Year’s. Not a lot of time, energy, or planning goes into resolutions. Many individuals make them on a drunken whim at the stroke of midnight. New Years is still in the season of Winter. In the Winter, our bodies are still in a dormant state, even if you live in a warm climate. When our bodies and brains are in a dormant state, it is often much harder to start new projects or make big shifts and changes. This is the main reason why resolutions made in the winter, frequently aren’t kept. In Daylight Saving Time, our body doesn’t want to adjust, because it goes against our body’s natural circadian rhythm. If you are fortunate enough to live in Hawaii or Arizona, congrats! Your body doesn’t have to go through the sludge for a week or so trying to adjust to a new time zone. Some states have petitioned to get rid of Daylight Saving Time, including Florida, but has been held up in the red tape of Congress, go figure! Although, New Year’s is the time known for making changings for the upcoming New Year, it is Spring Equinox when new goals and aspirations usually hold more power to seeing these goals to fruition. Why do you think this is? When you think about a planting season, it is generally started right at Spring Equinox. Our bodies already go with the ebbs and flows with the earth, just as the plants do. Our brains come out of the winter fog so to speak. We have more vigor and energy. The sun is starting to stay out longer. Our bodies are more apt to dump the toxins from the long winter. The fresh fruits and vegetables are more readily available in the Spring. Produce that we purchase in the winter months are usually force grown in the wrong season. They are certainly effective, but studies have shown they are not as full of nutrients as they are in the Springtime. How can we make the most out of a Spring Resolution and have better success than we do at New Year’s? Make goals not resolutions! When we make goals rather than resolutions, you are putting more energy and focus behind what you want to accomplish. The outcome is easier to achieve. I can help you with your Spring Cleaning goals! It is often easier to obtain goals when you have someone being your cheerleader and helping to hold you accountable for changes you need to make. It’s the perfect time to purge, renew and rejuvenate. 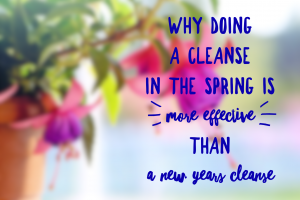 That’s why I’m offering the Body, Mind & Spirit Spring Cleaning program – a six-week customized spring cleaning program that addresses your personal goals and desires for all aspects of your being: body, mind and spirit. One of my favorite things about Springtime is my detox tea or capsules that I created called Spring Cleaning. It has 100% Organic Herbs all for cleansing the liver and gallbladder. Toxin Remover – Echinacea and Goldenseal are well known for removing all toxins from the body, fighting bacteria, infections and abnormal cells. Nettle cleanses and purifies the kidneys. Rosemary expels toxins of the livers as this natural diuretic cleans the excess water from the body. It helps rid the body of junk toxins so you can start with a clean slate. It is filled with vitamins and minerals that help give your body that boost it needs. It also strengthens the immune system. If you are wanting to lose weight, boost your immune, or just detox, this product will set you straight! I am offering individualized meal plans for 6 weeks, and exercise regimen that you will actually LOVE. Each person has different food preferences and body requirements. I will personalize each meal plan depending on your desires or health conditions. Click on the link below and I will be happy to customize a 6 week program just for you. It will also include a Spring Cleaning Tea or Capsule. If you just want to take part of the Spring Cleaning blend without the program, here is the Amazon link for teas and capsules.